On May 17th, 2016 POLYHEDRAL DUNGEON was released unto the world. 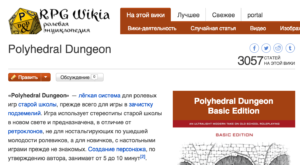 POLYHEDRAL DUNGEON is an ultralight modern take on old school roleplaying. 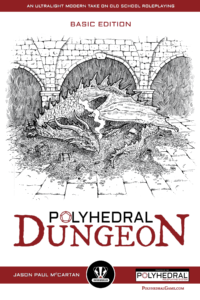 Using the new and simple to use and extend POLYHEDRAL SYSTEM, you can have countless hours of fun delving into dungeons and stealing dragon’s hoards. Choose from the classic old school character tropes, but with slight twists. Play classic dungeon crawls with a flexible unified system that’s easy to learn and extend – make up your own content, or use any of the official Expansions, including The Advanced Rules which provides many new options for play, The Book of Monsters which expands and explores the Monsters in the game, The Book of Loot for more complete treasure and loot options, including many unique items, and The Book of Magic, which expands Talents and rules for magical and divine characters. Designed for quick pick-up play as well as to handle large groups of players who have little experience in tabletop roleplaying – a perfect beginner’s game and still fun for experts.